When I was in college, there was only one local store in which you could buy recycled notebook paper. It was loose leaf, and it only came in a grey color. It was expensive, but I insisted on using it. Now, recycled paper is quite common, but there are even more options now. Tree-free papers exists! 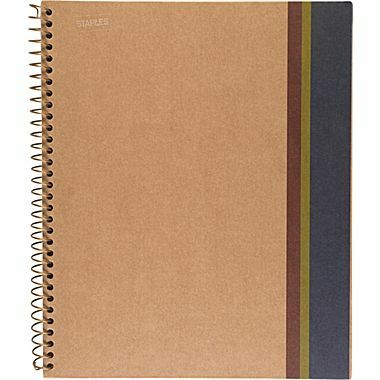 We were sent [amazon_link id=”B00F3L0YXO” target=”_blank” ]Sustainable Earth By Staples 100 Sheet Lined Notebooks[/amazon_link] in two sizes, as well as a AvantPro™ Pen with SilkScribe® Ink! I really love these notebooks! They even have a little pocket inside the front cover. So handy! They are also quite affordable at only $3.99 and are made in Egypt. The pen is made of stainless steel, instead of plastic, and the ink is refillable. It’s nice that tree alternative and recycled paper is more readily available to consumers. Considering its affordability, there is really no reason for anyone not to make this simple, greener change.